When you compare yourself to the world-leading brands, don’t you feel hopeless? They spend millions on ads and resources to create campaigns that get instant traction and reach millions of people. Resources that most brands don’t have. There’s no way in hell we can replicate their marketing results! But one thing we cannot forget is that these companies also started from the ground up at one point. Without millions to spend on ads. They didn’t have millions lying around at their disposal. Sure, their marketing spend might have increased dramatically since starting out, however, there are principles in marketing that are true no matter if you have $2,000 or $2,000,000 to spend. In big brands’ social media marketing strategies, there’s a lot of information you can extract. Then taking that information and implementing it in your very own strategy. And, of course, optimizing it according to your budget. Because it’s far more beneficial to acknowledge the strategies that have been developed by companies with tons of resources, than ignoring them and starting from scratch. You know what they say: Always learn from those who are better than you. In this article, we’re looking at how large corporates are using social media for marketing, and identify things we can learn from them. A brand that is the king of having a visual theme and a consistent brand message is Coca-Cola. What brand do you associate this colour with? If you said Coca-Cola, it means they’ve done a great job in marketing to you. When you’ve done such clever marketing that people associate your brand with a colour, you know you’re onto something. Sure, Coca-Cola has a huge, and I mean insanely huge marketing budget, that even some of the top brands can compete with. But that doesn’t mean you can’t use the same strategy, just at a much smaller scale. In fact, in 2014, Coca-Cola’s total ad spend was $3.499 billion in 2014! If there’s a brand that knows the importance of having a consistent visual theme, it’s Coca-Cola. If you compare their ads from 50 years ago and today, you’ll be surprised at how similar they are. And that’s also one very important reason to why they’ve been able to build their brand to the sheer size it is today. By making themselves instantly recognizable. By deciding on a visual theme and sticking to it, people will be able to quickly recognise your brand, and you’ll be able to build a strong image of how you want to present your brand. Or, more importantly: how you want people to perceive your brand. To have a consistent visual theme, you don’t need to have a million dollar budget. In fact, you don’t need to have a budget at all. All it takes is to share content that is coherent and that aligns with your brand – at all times. 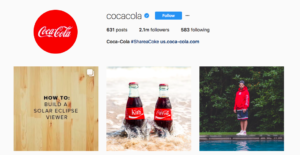 Just look at Coca-Cola’s social media content across their profiles. How about their Twitter account? It’s pretty clear what colour they want you to associate with their brand, right?  Well, that’s also part of the reason to why you said Coca-Cola when I presented the red-coloured image above. The first step to creating a consistent visual theme on social media can be as simple as having the same logo across all your social accounts. The foundation to building a coherent visual theme is to choose a theme then stick to it. But how do you decide on a theme, and what goes into a theme? The most vital parts of building your theme are the following. In some cases, rebranding work, but if you’re a company like Coca-Cola that have spent billions on making your audience relate to your theme, I am not so sure it would work. If Coca-Cola would decide to rebrand and change everything from logo to colour, do you think they’d benefit from it? The bottom line is: decide on a theme and stick to it. Consistency is key in marketing. Sharing user-generated content is a surefire social media method that works. In fact, 85% of users said that user-generated visual content was more influential than brand photos or videos. Moreover, 93% of consumers find UGC to be helpful when making a purchasing decision. 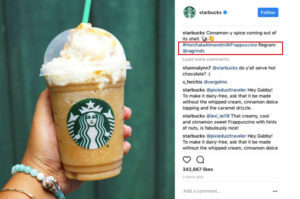 I could be rambling all day about the power of sharing user-generated content, but instead, let’s look at how Starbucks have used (and is using) user-generated content on social media, and gains tremendous results from it. In 2014, Starbucks launched the White Cup Contest. 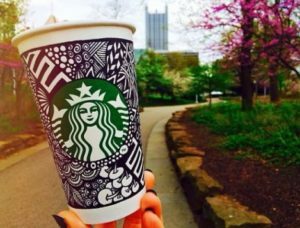 Customers were asked to draw and doodle on their white Starbucks cups and then submit pictures as entries. The winning entry would be used as a template for a new limited edition Starbucks cup. The UGC campaign saw close to 4000 entries in a matter of three weeks! Want to know the best part about a successful UGC campaign? Starbucks gained two highly valuable things from this campaign. First, they gained a ton of free exposure. Imagine almost 4000 people posting a photo of Starbucks’ cup on their social media page. With the fact that 92% of consumers around the world say they trust recommendations from friends and family, above all other forms of advertising, it’s easy to see how effective this campaign really was for Starbucks. Not only did they gain exposure, but they gained the best type of exposure you can get as a brand. Secondly, with the campaign, Starbucks showed that it values customer feedback. Something that is highly appreciated among customers, and that presents them as more caring. In addition to that, the campaign gained ton of media coverage which lead to further exposure for the brand. It doesn’t stop there for Starbucks. A campaign eventually fades out into an end, but does that have to mean that it is the end of sharing user-generated content? Starbucks have realised this, and on their Instagram account, about 6 out of 10 posts are user-generated content. User generated content gives you free content to use on your very own social media pages, and by showing that you are actually sharing your audience’s content, you encourage more people to share content, thus leading to further exposure for your brand. If you think about it, sharing user-generated content as a brand puts you in a positive loop that you don’t want to get out of. The beauty about influencer marketing is that it can be done with any type of budget. You, as a small brand can use the same marketing tactic as some of the major corporations – only at a smaller scale. Watch brand Daniel Wellington is probably the most famous and well-known example of a brand that successfully implemented influencer marketing as the main marketing tool – and gotten tremendous success from it. Today, Daniel Wellington is a $200 million business, much thanks to the power of influencer marketing. 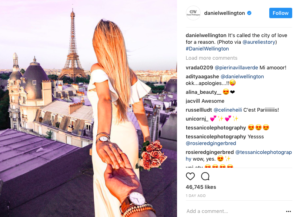 Daniel Wellington targeted thousands of influencers across a range of niche groups, including travel, fashion, photography and lifestyle, paying many of those with one thing: a watch. Also, every influencer was handed a 15% off personal discount code so that the influencer could make a cut of each watch sold. Of course, larger influencers prefer money as payment for exposure on their social media pages, and that’s also why Daniel Wellington first and foremost partnered with micro-influencers with a smaller following, yet a more targeted and engaged one – paying with only a watch. Daniel Wellington literally mass-sent watches to every micro-influencer they could come across that they found was suitable for their brand, and is still doing so tip date. Because Daniel Wellington watches have such a high profit margin, influencers feel like they are making a great deal, while Daniel Wellington thinks equally so. This just goes to show that you don’t need to have millions of dollars in marketing budget to gain success from social media marketing. In fact, when founder and CEO of Daniel Wellington Filip Tysander started out, he had 250,000 Swedish crowns, equivalent to around $31,000. And that’s not just the marketing budget. That’s the total budget. The key to a successful influencer campaign isn’t necessarily to have the largest budget. You can have millions of dollars to spend, but still generate worse results than someone who have 100K. The key is knowing how to spend it. 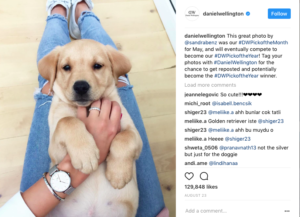 One of Daniel Wellington’s largest marketing source is still influencer marketing, and almost wherever you go on social media, you come across influencers who are promoting DW watches. So what was their secret to generating such tremendous results? Well, the first reason has already been mentioned. They partnered with thousands of influencers. However, the second reason is more important than the first, and that is that they only partner with influencers who resonate with their values and brand, and influencers whose followers are DW’s target audience. The key to a successful campaign is about creating a campaign that comes off as authentic and genuine, and this can only be achieved by partnering with influencers who would actually use your products even if they weren’t paid/rewarded for doing so. A whopping 75% of marketers consider finding the right influencers the most challenging aspect of influencer marketing. That’s not a good thing considering that the influencer you partner with play a vital role in how successful your campaign is, and what results it is generating. With influencer networks like Veloce, you can filter influencers based on your preferred criteria and get the most relevant influencers for your brand in the search results – all hand-picked and carefully selected. Video marketing is on a huge upswing. And if you look at the results its able to generate, it doesn’t exactly leave us wondering why it is happening. Okay, those are two highly interesting statistics that tell us that the interest in video is increasing. Well, they’re impressive as well. 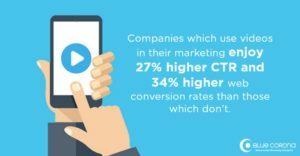 In fact, 52% of marketing professionals worldwide name video as the type of content with the best ROI. It’s not strange at all, because 92% of the information transmitted to the brain is visual. The best part is that you can create amazing videos with the help of basic camera gear, that generates incredible results for your brand. All it takes is that you know what your audience wants to see, and what type of content resonates well with them. If you create a video of your product circulating on a stand, you’re dead out of the water. Every day, millions of videos are published. To stand out, you need something fresh, something unique. Just like Dollar shave club. When Dollar shave club started out, they didn’t have endless of resources, so they took it to YouTube. A platform that anyone can use no matter the resources. A platform where it is completely free to upload videos to the world. In 2016, Dollar shave Club was acquired by Unilever for $1 Billion. And they have Youtube to thank. Not only, but it plays a vital role in their brand’s success. Because YouTube was the platform that put DBC on the map for men’s razors. The video that is most well-known, and was DSC’s debut video has gained over 24 million views on YouTube. The video wasn’t created with the largest budget, nor was it done in the most professional way, but still, it was able to get exposure that most brands can only dream about. What is it, really, that makes a successful video? If you would pay for 24 million views on a channel such as Google ads or Facebook ads, you’d have to pay quite a large sum for the same amount of exposure. But DSC got the exposure for free with the help of smart video marketing! 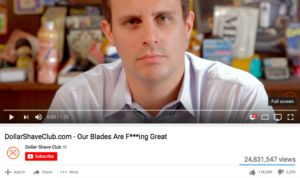 What made Dollar Shave club’s YouTube videos such a huge success? Their videos resonate with their target audience, and makes their customers laugh! All at the same time as they’re promoting their razors. You sell more by not selling, and you generate better results by being you. Of course, not all brands will reach success by swearing and joking in a video. Chances are, if a conservative company like Bank of America would try to replicate the same video, they’d be faced with a lot of criticism. That’s why it’s important to know your audience and to know how you want people to perceive your brand. Based on those two things, you can start creating videos that go viral and gain you tons of exposure. There’s a lot we can learn as small businesses from large corporates and their social media efforts. When looking at the budgets they have, however, it feels like there’s no point in paying attention to their efforts. They spend millions, and sometimes even billions o advertising so it’s not strange that you feel distant from them. But ignoring them completely is a foolish move. These brands invest a ton of resources in researching the best and most effective marketing sources, and even if you can’t invest millions into the same marketing sources they are using, many of them can still be implemented into your marketing strategy – just in a smaller scale. Are you looking at what large brands are doing on social media?